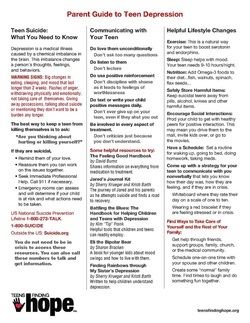 Teens Finding Hope, Inc. Facts for Parents - Teens Finding Hope, Inc.
Click above to download our Parent Guide to Teen Depression. Teens can be very moody, indifferent, sleep lots or sleep little, yell one moment and want a hug the next. How can I tell the difference between “normal” teen behavior and when I should look for help? ​Depression is a mental illness that is caused by an actual chemical imbalance in the brain. With depression, Serotonin, which is one of our Neurotransmitters that transfer information in the brain does not do its job correctly. Some researchers believe the shift in mood happens when there is a shortage of Serotonin. Antidepressants like Prozac stop the absorption of Serotonin so it does not disappear. Teens are not able to “snap out of it” because depression is a medical disorder that needs treatment like medicine, counseling or both to get better. Many researchers believe that an imbalance of serotonin levels may influence our moods, leading to depression. 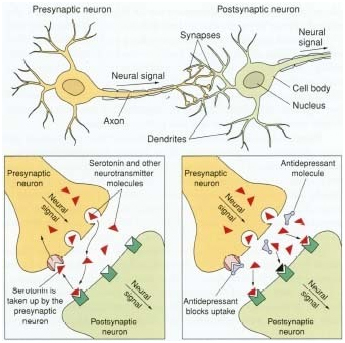 When our brain makes lower levels of serotonin, lacks receptor sites that are able to receive the serotonin that is made, shows an inability of serotonin to reach the receptor sites, or has a shortage in tryptophan, the chemical from which serotonin is made, depression can result.